Bayern Munich and Liverpool, both five-times European champions, will meet in one of three England-Germany clashes in the Champions League round of sixteen following the draw made at UEFA headquarters on Monday. Holders Real Madrid will face four-times winners Ajax Amsterdam, who have reached the knockout stages for the first since 2005-06. 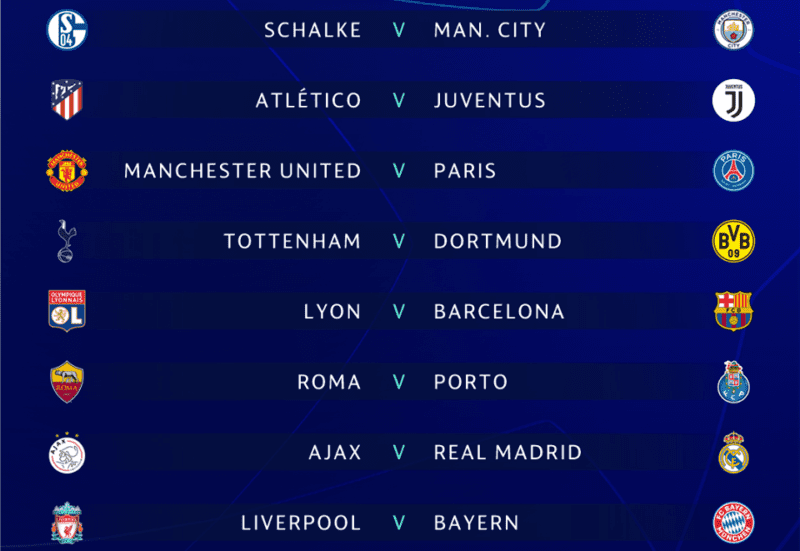 In other ties, Manchester United take on Paris St Germain for the first time while Serie A champions Juventus face Europa League winners Atletico Madrid, Barcelona meet Olympique Lyonnais and AS Roma tackle Porto. Liverpool coach Juergen Klopp has the chance to renew a fierce rivalry with Bayern which dates back to his days in charge of Borussia Dortmund where he won two successive Bundesliga titles. Overall, however, Klopp’s record against Bayern is not the greatest with eight wins, five draws and 16 defeats. Liverpool, who finished second in their group behind Paris St Germain, will play the first leg at home. Recent form would appear to favour Manchester City against Schalke as Pep Guardiola’s side are unbeaten in their last seven matches against German clubs, winning six of those. Tottenham forward Harry Kane will also be looking forward to facing Dortmund, having scored three times in two matches against them. Real Madrid are firm favourites against Ajax, having won their last six games against the Dutch side, scoring 20 goals in those fixtures and conceding only two. They were 4-1 victors both in the Netherlands and Spain in the most recent contests, in the 2012-13 group stage. History is also in Barcelona’s favour against Lyon as the Catalans have won five and drawn one of six previous meetings. Juventus and Atletico Madrid have met only twice before, in the Champions League group stage in 2014-15. Those games produced one goal between them and with the same coaches still in charge — Massimiliano Allegri at Juve and Diego Simeone at Atletico — another cagey encounter is likely. “We have a very strong team so we are confident,” said Juventus director Pavel Nedved. “Atletico are a very balanced team, difficult to face. However, Atletico are also one of Juventus forward Cristiano Ronaldo’s favourite opponents — the former Real Madrid player has scored 22 goals against them, a total he has bettered only against Getafe (23) and Sevilla (27).